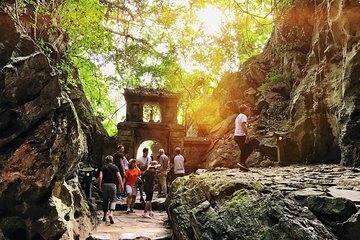 Rendez-vous dans les Montagnes de Marbre et la péninsule Son Tra lors de cette excursion d’une demi-journée au départ de Da Nang. Vous visiterez des grottes mystérieuses cachées et découvrirez la statue de marbre de 67 mètres de hauteur située à la pagode Ling Ung. Profitez d'une superbe vue et visitez Non Nuoc, un village de taillage de pierre vieux de plusieurs siècles. Transport depuis/vers l'hôtel inclus. Our guide was very friendly, knowledgeable and had good english. He took numerous photos To be uploaded later of us and was very obligeing. The time at the Laddy Buddha and Marble Mountain sites was sufficient and left uss the afternoon for pur own devoces. We enjoyed our 1/2 day, and especially the visit to the caves, although there were various glitches...The description fails to mention that the tour includes a visit to the Lady Buddha, which we had previously seen the day before by hiring a taxi to take us there. They guide was also not informed that we were doing a second 1/2 tour with Viator, and that the morning tour person was supposed to facilitate our arrival at the starting point of the second 1/2 tour. Still another glitch occurred when the bus driver pulled over to the side of the road and stayed too long twhile the tour guide was attempting to resolve our drop off spot and then proceeded to get a ticket. Two policed officers took at least 20-25 minutes before taking their bribe all agreed likely, and letting the driver go. Very good tour both Marble Mountain and Lady Buddha. We were picked up promptly and had a friendly team of guests on the tour. Nice friendly tour guide, full of knowledge for both trips. Only thing you do need on the marble mountain excursion is a good pair of shoes/trainers and suitable attire to withstand the climbing on the different terrain on the mountain you have to climb and come down. The one negative that puts me off the tour is the pushy selling at the sovereign shops, when the sales team seem to pound on you, this part is definitely unnecessary, it puts a negative on the tour before it has even began. The both visit I would recommend, well worth the trip. A beautiful spot, and our tour guide was very informative, friendly and good fun. Really enjoyed both places we visited on this tour, even more than I thought I would! Fantastic views back to Danang and the ocean from the Lady Buddha on Son Tra, amid beautiful temple grounds with bonsais and statues. The caves and sculptures in the Marble Mountain were quite thought-provoking - I thought the two Buddhas playing chess in one of the caves was particularly surprising and curious! Our guide, Eric, was really fun and had all kinds of intriguing information about both places and Buddhism in general. Both places are beautiful, well worth seeing. Our tour was excellent in extremely hot humid conditions we braved the steps to the top of Marble Mountain. Ming our guide was informative and was considerate of our needs in the weather conditions. This tour was the perfect length of time. We saw everything we wanted to see without feeling rushed. Our tour guide, Eric, was wonderful! He provided very interesting information along with entertaining anecdotes. Highly recommended! Guide was informed and nice, Tour was well organized. I recommend it. Fantastic tour - Marble mountain is amazing! 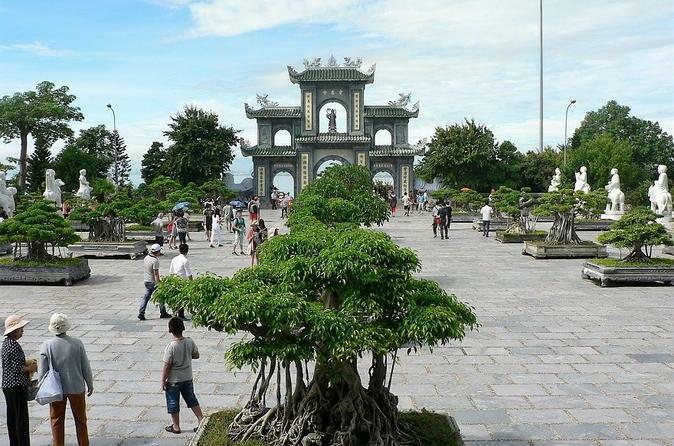 It was fun on this laid back tour to explore some places in Danang and Buddhism as well. Received some new learning on Buddhism from the tour guide Sorry, can't recalled the name of this nice tour guide.